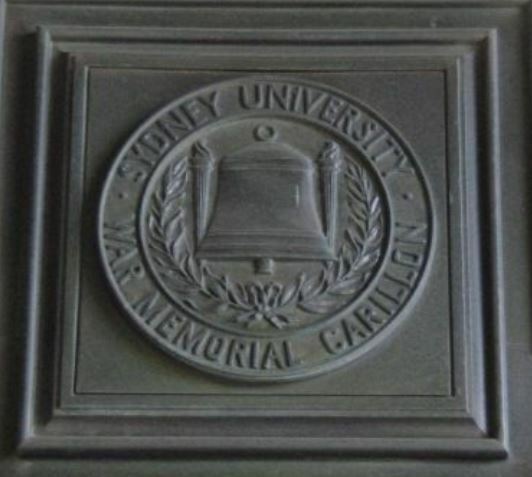 In 1924, fundraising began for a carillon at Sydney University, to remember the undergraduates, graduates, and staff who died in World War One. When they hear the glorious peals of the carillon, young men will see visions and old men will dream dreams. Justice Street. The project was not without controversy. Some feared the old clock tower could be damaged by the installation of the bells and the carillon mechanism. They agitated for a separate campanile, which they argued would produce a purer sound. Fortunately, the nay-sayers were overruled by those who insisted the fallen deserved only the best, and that the best location was the prominent clock tower. The bells were cast in England by John Taylor & Sons, at Loughborough, Leicestershire and the Whitechapel Foundry in London. They arrived aboard the steamship Port Gisborne, and were unloaded at Woolloomooloo. Next, they were placed on horse-drawn trolleys for the final stage of their journey. What an amazing sight it must have been. The procession rolled on via George Street and Railway Square. 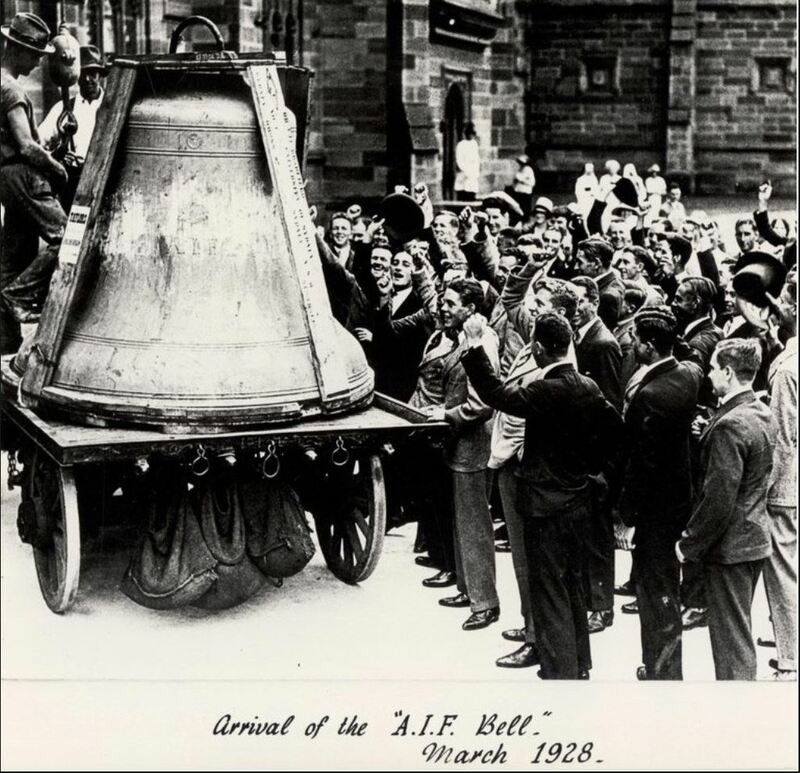 The largest bell was dedicated to the A.I.F as a whole. and had been open to public subscription. 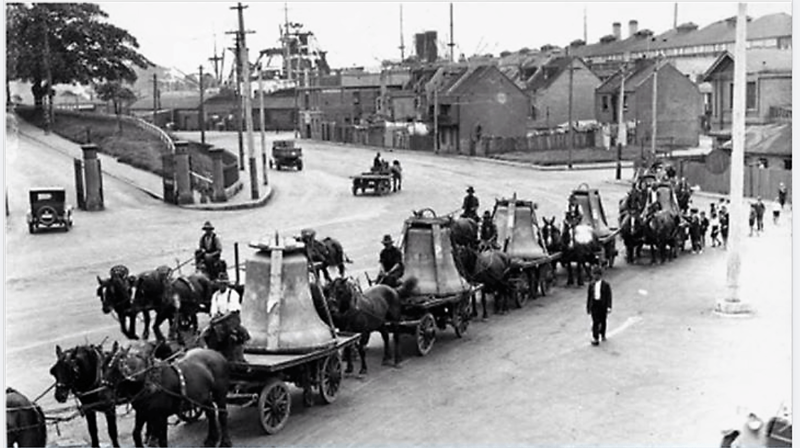 The bells were in place for Anzac Day that year. 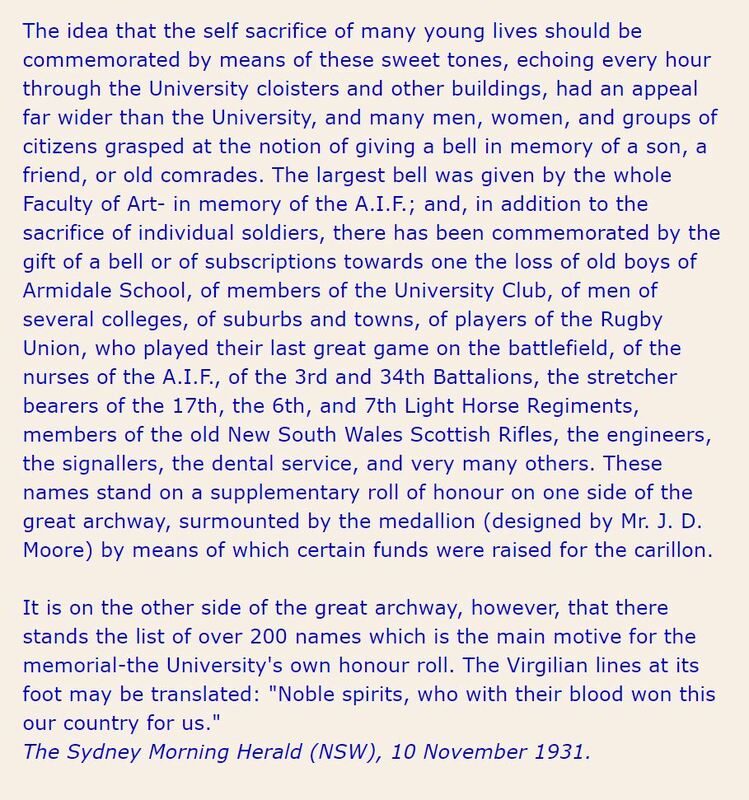 The inauguration of the carillon was the keynote of an impressive service at the University of Sydney on Anzac Day…..The audience stood with bowed heads while at intervals of five seconds the great bell tolled 18 times for those who fell in the war, 18 being the youngest age at which youths would volunteer. It was the first time a note was struck by the carillon, the only instrument of its kind in Australia. Chopin’s Funeral March was played that first day, followed by the National Anthem. 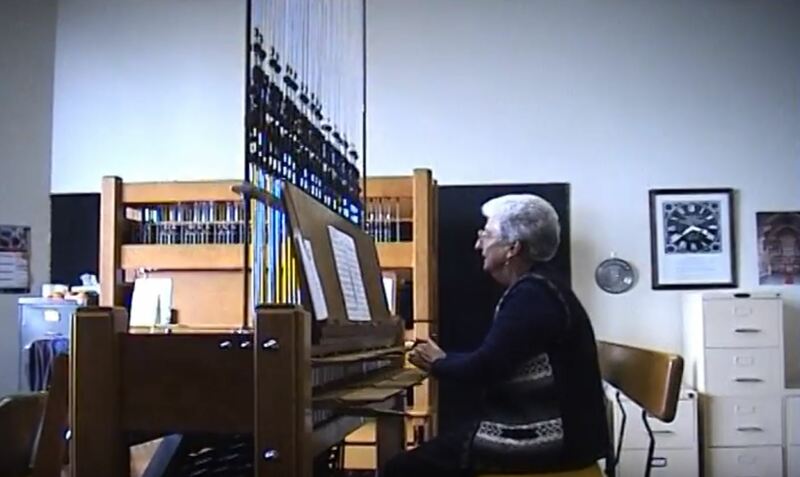 A carillon has fixed bells, and is operated via a form of keyboard. Virtually any tune can be played. More than three years after the bells were installed, a dedication service was held for the University honour roll. An article in the Sydney Morning Herald spoke of those who contributed to the carillon, and paid tribute to those who gave their lives. 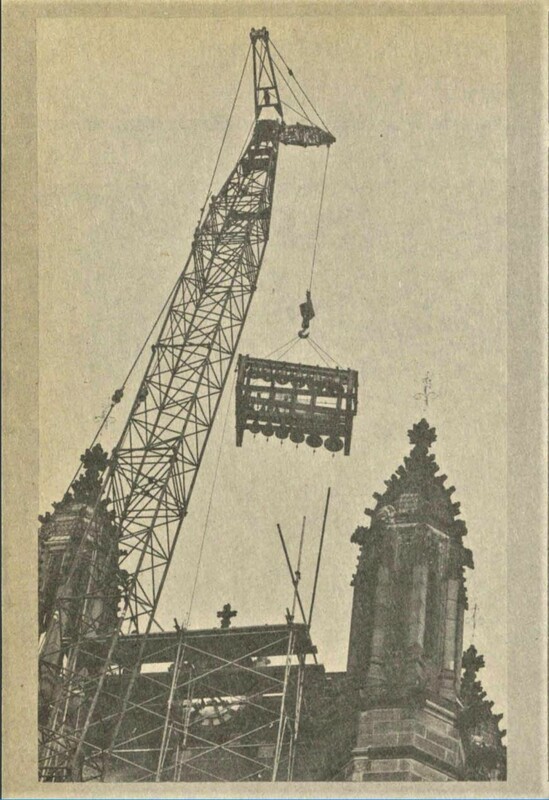 It was 1977 when the new bells finally arrived at the university and were lifted to the tower by crane. An additional five had been ordered, taking the total to 54. Moving the bells into the tower. Bronze music’s cage birds, captive here in stone. Of their wide throats echo each measured tone. Click HERE to listen to and watch a wonderful ‘duet’ being played between the carillon and the university’s organ. Wonderful story. And thank you for linking the video. It was absolutely beautiful. May I suggest that when you add a link to your post you set it to open in a new link so you don’t automatically lose your reader. Often they don’t come back once they have left the page. Love all your posts. Hi Diane. Thanks, and especially for that advice about the links. It had never crossed my mind and I have no idea how to do it, but will see what I can do. Might have to check with my webmaster! Enter your email address to receive notification of new stories on this website (your address will not be shown). Find us in Pandora the National Library of Australia's archive of Australian online publications in perpetuity.